Part of being an early adopter in the VR space means having to deal with dangling cables and cords, at least for headsets like the Oculus Rift and HTC Vive. The question is, how badly do you want to go wireless? 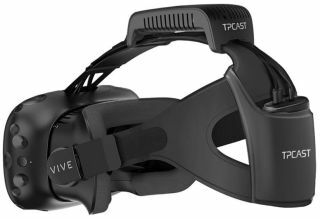 If you're willing to spend an additional $220 on top of whatever you already invested into VR, there's an upgrade kit made by TPCast for the Vive that makes it wireless. The Vive provides room scale VR experiences and requires a powerful PC to do that. While this add-on isn't the only wireless VR solution to hit the market—Samsung's Gear VR is one of several alternatives—it is the first to cut the cord for room scale VR. Alvin W. Gralyin, China Regional President of Vive at HTC, told UploadVR that the wireless kit would "greatly improve" the overall Vive experience. He also claimed there's no "noticeable difference" from using the wireless kit due to lag versus being tethered to a PC. Consumers may balk at the asking price after having already spent $799 on the Vive headset, which is on top of the cost of PC parts that are powerful enough to drive a VR experience. However, it's not just home consumers that HTC and TPCast are targeting here. They also envision VR arcades taking advantage of the accessory, as it would allow them to offer multiple VR stations without the worry of players tripping over cords. The initial version that is up for pre-order on Vive's Chinese website is available in limited quantity and uses a standard battery that's good for up to 1.5 hours of gameplay. It will ship sometime in the first quarter of next year. Sometime down the road, HTC and TPCast plan to sell an optional bigger battery.